My kids are starting their final exams today. And because tomorrow is a public holiday, they will finish the exam next week. 2 more subjects have been added to the final test. Usually they only have 9 subjects tested, now it becomes 11 subjects. The school will dismiss earlier during the final exam week at 12PM so I didn't prepare lunch bento for the kids only snack bento. They can eat it during the break between the tests. I put sandwich filled with chicken floss and butter inside, fruits, mixed nuts, and decorated with an angel on the top of the sandwich. Angel is coming with the gift for well behave kids! We celebrated hubby's birthday yesterday. We had a delicious lunch at the Rustique Grill & Wine restaurant after Sunday Service. Kids woke up early to surprise their Daddy with the birthday cards and presents, hugs and kisses. We had a great time together. So, how was your weekend? Hope all of you had a good time too. Happy Bday for Mr. Bentolicious! Gud luck for the exam kids! Super cute angel, Lia..love the details you made. Will need to borrown your idea one day...hehe...thanks yar. 11 subjects? Wow, that's a lot, I hope they do well! This bento is beautiful! I love the tiny fruits, they're so cute! oh thank you for that present you cute little christmas angel! your smile is soooooo adorable i could just eat you up! :). happy birthday to your husband Lia! God bless to your family. @The Bargowo : Thanks a lot Menoq! I always nervous when they have an exam. I think they get bored to hear me saying 'have you study that?' for every 30 minutes hahaha ... I'm going crazy :D Good luck to your daughter too! Oh Happy Birthday to the Mister! That is the best gift of all isn't it? When your kids wake you up early to give hugs and kisses! Sounds like you all had a great weekend birthday! Cute angle bento!!! love it!!! Good luck for the final exam to both A&A ^_^ I know they will do great as always! Nice to hear you had a great day with hubs! He certainly deserves the best! 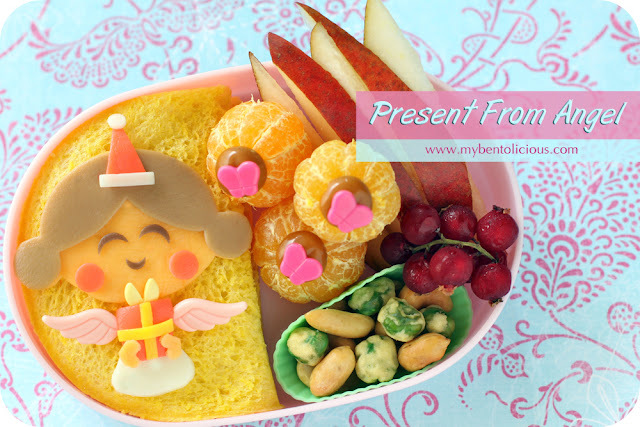 And your snack bento is superb... that angel is so cute!! Have a great day tomorrow and I hope the kids can enjoy it too ! Such a unique and distinctive (and beautiful!) bento you have dear Lia! Perfect angel. It warmed my heart to read of such happy family events! @karaimame : Nothing wrong with the school but something wrong with the calendar hahaha ... Good thing that the kids don't feel burden or stress out for their exams :) Thanks a lot Lilian for your support! So sweet and perfect! Paige would love this! What a sweet-looking and pretty angel! So cute!!! Oh my..11 subjects?! Tough being a kid nowadays huh? !